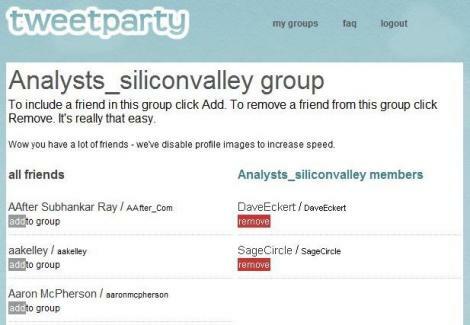 Tweetparty, which is free, is very simple to use. You set up an account using your existing Twitter handle. 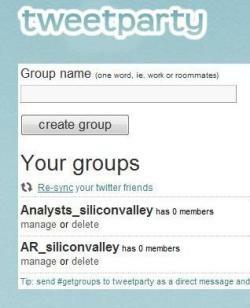 After it has downloaded your followers you can set up various groups. This is done by creating a name and picking followers to add to the group from a list of all your followers (see Graphic 2 to below). The DM shows up in your Twitter Sent folder as any DM. Within minutes, individual DMs generated by tweetparty also show up in your Sent folder as if they had been sent by you. As with any communications technology, tweetparty is not the end-all and be-all but just another tool in the AR toolbox. Bottom Line: Social media provides AR with valuable tools to enhance relationship building, intelligence gathering, and communications. However, AR professionals have to be careful to focus on those tools that provide most ROI. One way to enhance the value of social media is to use tools like tweetparty that improve the efficiency of using social media. Question: What are your favorite Twitter tools? In this SageCircle AR Workshop, we provide AR professionals with information, tools, and insights to make sense of the fast evolving social media scene. The goal is to help you get up-to-speed on the implications of social media for AR so that you can make the important decision whether and how to add social media to your mix of interactions.